Wat Suthat is a magnificent temple in Central Bangkok but one which is often neglected by tourists. Visit Wat Suthat to get away from the tourist crowds. Wat Suthat is one of the oldest and largest temples in Bangkok but one which receives relatively few visitors in comparison to nearby Wat Po and Wat Pra Kaew, both of which are much more famous. Wat Suthat is a peaceful place and it is a functioning temple with adjoining monastery and resident monks and a constant stream of Thai Buddhists worshipping at two magnificent and famous Buddha images. Wat Suthat Thepwararam Ratchaworamahawihan is the full name of this temple founded by King Rama I soon after his coronation in 1782. Construction was continued in the reign of King Rama II and completed by the artisans of King Rama III in the mid 1800s. Today Wat Suthat remains a revered place by Thai worshipers but infrequently visited by tourists. On this page I will point out the highlights of visiting the temple and give some advice on how to behave when you are there. 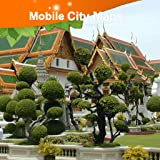 No more carrying unwieldy paper maps around and wrestling to fold them up because here is a detailed Bangkok street map available as an App for mobile devices using Android. The maps have annotations in English and Thai script which is important because most foreigners struggle to pronounce Thai place names correctly which leads to confusion when asking directions. Just pull out your mobile device and point to where you want to go and sooner or later a friendly local will point you in the right direction. 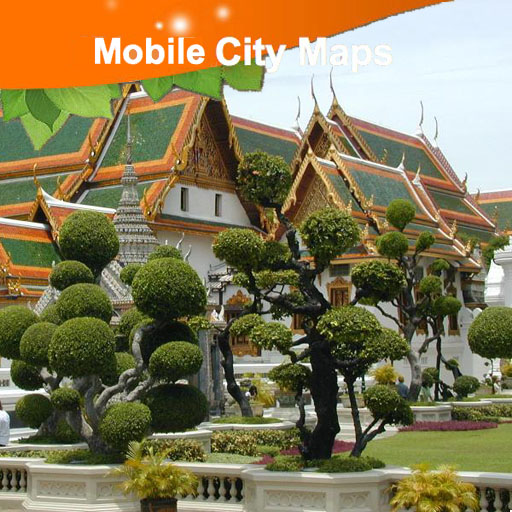 Great for getting to Wat Suthat and all other locations in the capital city. 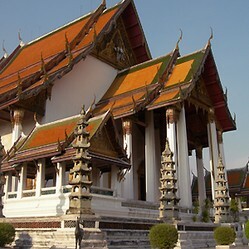 As visitors step through the entrance after buying their ticket they enter the main courtyard of the temple and the building in front of them is known as the Wiharn; this is where the main Buddha image is kept here and in all Thai Buddhist temples. Walking around the courtyard visitors can get a good view of all aspects of the building although it is extremely difficult to capture the whole building in one photograph. It is a pleasant experience to walk around and take a look at the colorful temple and its reflections on the polished floor before actually entering the Wiharn. In the photo here you can see the Wiharn on the left and the roof of the Ubosot (ordination hall) in the background. The reflection in floor can be seen too. When I visited Wat Suthat it was about 4pm and very few other people were present allowing me to walk around the courtyard alone. The courtyard felt much larger than it really is and very peaceful indeed which is amazing considering how close to Bangkok's congested traffic it is. N.B. - The spelling "Viharn" is most frequently used when referring to this building. However, there is no "V' consonant or sound in Thai and a more correct transliteration, in my opinion, is that which I have used "Wiharn". Visitors enter Wat Suthat through the main entrance on Sao Ching Cha square and they will see signs directing them to the ticket office on the right. The entry fee for foreigners is only 20 baht (Thai people enter free as it is a place of worship for them) which is very cheap. Although it is quite easy to enter via one of the various other gates to the temple without paying please do not do this; the officials of the temple trust visitors to do the right thing and walk around to the ticket office, please do not give them reason to distrust foreign visitors. 20 baht is less than $1. Surrounding the Wiharn of Wat Suthat are the peaceful and shady cloisters. In fact as one walks in the main temple entrance, the rows of Buddhas on the left and right are one of the first things that visitors will notice. These Buddhas are very photogenic but it should be remembered that these images are highly respected by Thai Buddhists and the varied state of repair of each one reflects the fact that various families sponsor the images and remains of family members are often interred in the base of the Buddha or in the wall next to the image. Apparently there are 150 of these Buddha images in the cloisters although I did not count them myself. Please treat these Buddha images with the respect that you would any grave or memorial to the dead. The cloisters of the temple are much cooler than the blazing hot sun in the courtyard and are used for rest, for teaching and quiet meditation. If you need to take a break from the intense heat just slip off your shoes and sit in the cloisters where you can chat quietly or check out your photos. Visitors must take off their shoes before entering the Wiharn to see the main Buddha image. The image of Phra Sri Sakyamuni is eight metres high and was brought to Wat Suthat from Sukothai by King Rama I. A week of festivities were held to celebrate its arrival and any visitor can see why - it is magnificent. The paintings on the walls and columns inside the Wiharn are wonderful too, some of the best in all of Thailand; these were restored in the 19080s after damage from bat guano! The restoration was worth it as the combination of huge golden Buddha and wall paintings make for an incredible scene. Nobody minds tourists taking photographs but there are bound to be Thai Buddhists praying here so please conduct yourself properly and take your photos unobtrusively. Visitors should always remember not to point their feet at the Buddha; if you watch Thai people they tuck they feet underneath and behind them when in the Wiharn. This bronze Buddha image was thought to have been created in the 13th century and the ashes of King Rama VIII are interred at its base, making this a very revered Buddha image indeed. Visitors will notice a lot of grey, unpainted and unadorned statues, figures and towers around the grounds of Wat Suthat. These objects are all originate from China and are thought to have arrived as ballast on boats trading between Thailand and China in the reign of King Rama I (late 1700s). These Chinese style figures are found in quite a few of Bangkok's Buddhist temples but as far as I know they have no real link to Buddhism; they are just there for pure decoration. Personally I hate these things and you will notice that I have tried my best not to get them in my photographs; as far as I am concerned they should have remained as ballast or been dumped overboard! Presumably the Chinese had no great love for them either if they were just dumped in the bottom of a boat. I know many other people will not share my opinion on these sculptures but I think they look out of place. Whatever you opinion, these are another aspect to a visit to Wat Suthat that will interest many people. In Thai the ordination hall is known as the Ubosot and the one at Wat Suthat, at 72 metres long, is the largest in Thailand. When visiting the temple, the roof of the ordination hall is a dominant characteristic with its green and orange tiles. In fact the building is so large and so close to other temple structures that I found it impossible to get a meaningful photograph! However, I was able to enter the Ubosot and see a very spectacular scene of around 50 monks chanting in front of the Buddha. I was not actually too sure if I was supposed to be there during this ceremony which apparently happens daily in the late afternoon. I had a quick chat with the caretaker who said that it was okay to enter and sit at the back. I did this as the monks filed out and then took some photographs of the Buddha image: Phra Buddha Trilokachet. The heat inside the Ubosot was stifling! When visiting Wat Suthat do not leave after visiting the main Buddha image in the Wiharn, walk around the back to the ordination hall and take a look inside, it really is worth it. Once again, I had the place to myself after the monks had left the building. As I have mentioned earlier, one of the nicest things about Wat Suthat is how peaceful the place is. Although this is a well-known temple with Thais and is very important due to its Buddha image and it is the resting place of King Rama VIII, Wat Suthat does not receive the crowds that nearby Wat Po and Wat Pra Kaew do. The photograph shows the main entrance to the courtyard in which the Wiharn stands and only a monk and a temple dog can be seen. The fact that buying an entrance ticket is left to trust tells you something about visitor numbers. Wat Suthat is a very nice temple to visit to see what a functioning Thai Buddhist temple is like. After viewing the spectacular buildings and Buddha images take a moment to watch what the Thai visitors do. Many of them will be sitting quietly or meditating, certainly in the Wiharn and Ubosot they will be paying respect to the Buddha images. However, you will also see some of them taking photographs and acting like the typical tourist! I have given some guidance on how to behave in the temple throughout this page. Here I will summarize and add some more things to be aware of when visiting Wat Suthat so that you do not commit any cultural faux pas; nobody wants to be viewed as a bad-mannered tourist and equally nobody wants to get scammed. Do not wear revealing clothes. This includes shorts, short skirts and sleeveless shirts.Pay the 20 baht entrance fee before entering.Always give way to monks. This is particularly important for women who are not supposed to touch monks.Be quiet. Talking is fine but loud voices and laughter should be avoided.Take off your shoes where signs ask you to do so. Always take shoes off before entering the Wiharn or Ubosot.When taking photos of the principle Buddha images be aware that people are paying their respects to the images. Don't get in their way and disturb them. Just wait for a suitable time to take your photos.Don't consume food or drink inside the Wiharn or Ubosot. A bottle of water to drink from when outside these main buildings is fine.Take your time and enjoy the atmosphere. A sign in the temple warns visitors that no tour guides are ever provided and not to trust people who approach you pretending to be guides as they are likely to be scammers.If you are going to Wat Suthat by taxi or tuktuk don't fall for the old "It's a Buddhist holiday and the temple is closed. I will show you something else." routine. This will likely result in an attempted scam. Unfortunately there is no skytrain station close to Wat Suthat so visitors will have to negotiate the Bangkok traffic by taxi, bus, tuktuk or walk to get to the temple. If you are staying in or close to Khao San Road it is not far to walk. Simply go along the road to Democracy Monument and turn right (south). You will then come to Wat Suthat after about 1km. Take a taxi. Ask for Wat Suthat/Sao Ching Cha. Ensure that the driver uses his meter. Take a tuktuk. Again ask for Wat Suthat/Sao Ching Cha, negotiating the fare before the journey begins. Public buses numbers 12, 15, 42, 73, 96, 508 all pass through Sao Ching Cha square, the location of Wat Suthat. Bus routes for major attractions - Bangkok Metropolitan Authority's guide to the bus routes for all of the city's major places of interest. This is a great little travel guide which is really useful in planning a trip to Bangkok and is small enough to be carried around whilst visiting the city. The book consists of a series of top ten lists on topics such as temples, food, shopping malls, transport etc. It is a really good little book with a surprisingly huge amount of information. Poll - Have You Ever Been to Wat Suthat in Bangkok? Have You Been to Wat Suthat? No, it looks boring to me. My goodness. What stunning exhibits are these. An excellent travelogue. Thank you for posting. I've been there and agree it's a great place to visit. I enjoy visiting places virtually. This is quite an interesting place. Interesting and informative travel article with fantastic photos.